Cooling Turbine in Wood Lathe broken, now what. I have an old Craftsman 12” wood lathe (circa 1989) that recently had the cooling turbine fail. Checking online sources for lathe parts, I learned the the turbine and it’s plastic shroud are obsolete and not available. After the failure the lathe ran very hot. Can the lathe be run without the turbine and shroud? To keep the motor cooler, I would not use the case that covers the motor and drive belts. I don’t want to burn out the motor. I have nearly all the pieces of the turbine. I may try epoxying that all back together. Any ideas? Words of caution or advice? I mounted a “muffin” fan next to the motor on my small lathe. It technically has a fan but the built-in fan doesn’t blow much air and the motor runs hot. I think they designed it so that it wouldn’t pull so much dust into the fan because the motor is just below the bed ways. On my fan, I created a simple shroud so that the inlet is away from most of the dust. Sorry for rambling, but without photos, I’d just say that I’d rig some kind of fan to do the job. Don’t have any of my own pics of the lathe. Here is a link to the lathe manual. Parts are shown on page 34. Part #4 is the part that broke (the cooling turbine) and is no longer available. I mentioned that I would try to run the lathe without the cooling turbine and leave off the motor cover to allow for air flow. I plugged in the motor and within 30 seconds it started smoking. I let it cool down, blew out windings with air hose and retried the motor. Same results. Smoke bellowing from all over. I suspect more is wrong than the fan not working. I hooked up an old furnace motor to the lathe and was able to finish my project. 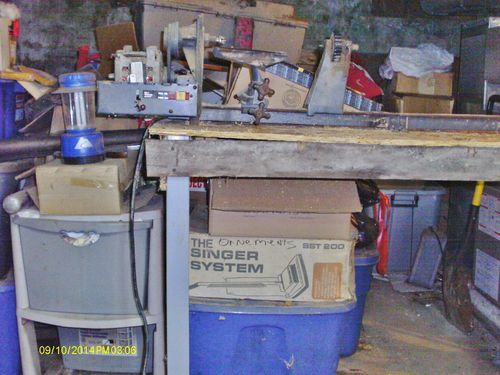 Now it’s Frankenlathe! 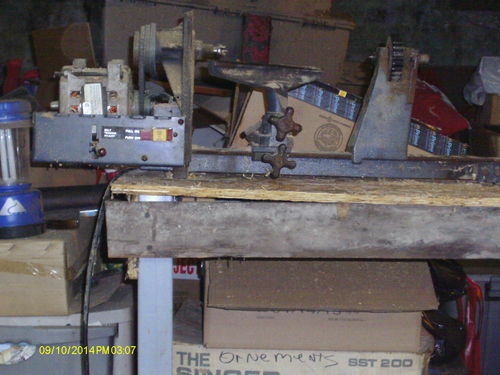 Same lathe I have used since it was new. ran the lathe without a cover forever….. Throwing mine out the door. Sending a few of the “good” parts to a friend. Mine started to throw the belt the las few times….no smoke, but a lot of bearing squeals…. You could just use a small fan to blow on it. Do not try and glue the fan back together, you said you had most of it. If not all of it, it would be out of balance and wipe out the motor even quicker. This was how mine had to run…for the last 10 years, or so. The joint in the rail system is another weak spot…..have had mine welded, once or twice. Rather brittle connection, will not stay flat.